Columbus Dr & 11th St. The park is located behind the Chicago Park District Maintenance building on Columbus Dr. 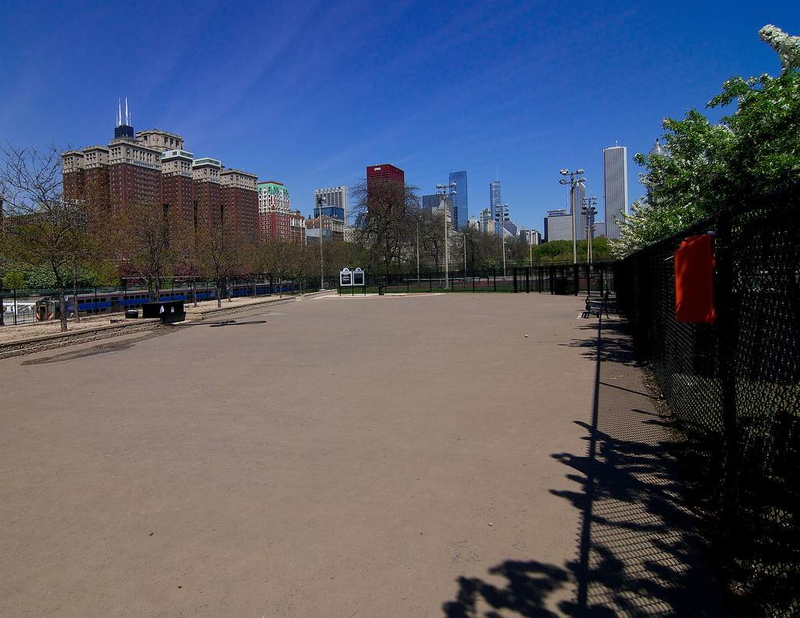 There are two paths to the park – from new 11th street bridge, as well as from Columbus Ave.
After 5+ years of work by the P.A.C., the South Loop community now has a large off-leash dog park (or D.F.A. ‘dog friendly area’) in Chicago’s “front yard”. Grant Bark Park opened on July 15, 2006 and is located near the tennis courts off of Columbus Avenue. The area is over 18,000 sq. ft in size, is fully fenced and double-gated, and has a tree-lined gravel area and lighting. At the north end is the area of commemorative bricks, along with a person and pooch drinking fountain. The Grant Bark Park is north of the 11th St. Pedestrian Bridge and west of Columbus Drive. Located behind the CPD facility on Columbus, the Park overlooks the Metra tracks in downtown Chicago.